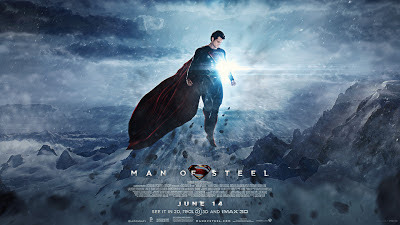 Two Tickets For...: Five Reasons Why... "Man of Steel" Will Be The Highest-Grossing Movie of 2013! Five Reasons Why... "Man of Steel" Will Be The Highest-Grossing Movie of 2013! So yeah, Superman has quite the hill to climb to catch Tony Stark's lofty perch at the box office, but I'm just crazy enough to believe that he'll be able to do it. So without further ado, here are Five Reasons Why... I Think "Man of Steel" Will Be The Highest-Grossing Movie of 2013. Nolan and Goyer is a bonafide tande, as we’ve seen with their collaboration on the Dark Knight Trilogy. No, Nolan isn’t directing the film this time, but it’s clear his fingerprints are all over this film despite insider claims that he was never really on or near the set during filming. His buddy Goyer wrote the screenplay based off a story that they both came up with, and while Zack Snyder is the director, it’s probably a safe assumption that Nolan and/or Goyer were right there with him along the entire creative process, filming and post-production in some way, shape or form. Hell, if you watch any of the trailers or TV spots for Man of Steel and they didn’t say Nolan only produced and didn’t direct, you probably wouldn’t notice the difference. When it comes to getting butts in the theatre, it doesn't hurt when you have the minds behind a trilogy that made over $2.46 billion at the box office. Have you seen these things? Do me a favor, even if you’ve seen these trailers before, watch them again one more time, then we’ll come back to this. Anyways, these trailers have created an intense amount of buzz on Twitter-sphere and elsewhere online. These two trailers on Warner Bros. official YouTube page alone have garnered almost 60 million page views. I think that bodes well for opening weekend, at a minimum. One of the biggest parts of Warner Bros.' marketing strategy has been to put the film's villain front and center (one of Paramount's biggest missteps with Star Trek Into Darkness). and that villain is General Zod, as played by Michael Shannon. While Shannon has always been a strong character actor in movies like 8 Mile, his star has been rising ever since his Academy Award nominated turn in Revolutionary Road, particularly with his performance in HBO’s Boardwalk Empire and another critically acclaimed turn in 2011’s Take Shelter. Not only does he have true acting chops, but he’s been gaining traction in younger demographics - for instance, this awesome Funny or Die video where he reads the infamous Sorority Girl Letter. Playing General Zod - arguably Superman’s toughest antagonist (note that I don’t say “biggest” because that’s obviously Lex Luthor) because he, too, is a Krytopnian like Superman is, and therefore has all the same powers along with military tactical knowledge – gives Shannon the chance to showcase his particular style of acting. Zod was famously portrayed by Terrence Stamp in Superman II, so while some Superman fans might be hesitant to see a new portrayal of him, he’s also not so famous as Lex Luthor that the general movie-going audience will be tired of seeing him again (like some were with Kevin Spacey’s Luthor in Superman Returns). That said, Zod is also know well-enough with superhero fans that I’d bet a large number of them are interested to see Shannon’s take on the character. Is it possible he does better in the role than Stamp, like Heath Ledger overshadows Jack Nicholson’s Joker now? I'm going to say he does, and he'll be a big reason why many viewers will want to return to the theatre to watch this film again. What does “four-quadrant movie” mean? As Wikipedia puts it, in the film industry a “four-quadrant movie” is a film that appeals to all four of the major demographics (or “quadrants”) that span the movie-going audience: both male and female, over and under the age of 25. And one of the best predictors of how a film’s box office will hold up is seeing at least three of those four quadrants seeking out the movie even weeks after the film has been released. Male Under 25: It’s Superman, it’s brought to us by the guys behind 300, Dawn of the Dead and The Dark Knight trilogy, and it’ll be action-packed. Duh. Male Over 25: An over-arching theme of Man of Steel will be the struggle Clark Kent/Kal-El has with having two fathers who both have gigantic impacts on who he is. Russell Crowe as his Kryptonian birth-father, Jor-El, and Kevin Costner as his Earthling adoptive father, Jonathan Kent, seem as though they’ve knocked their respective roles out of the park. I can safely say this from early reviews I’ve read and from my own reaction to their small clips in the trailers. Don’t underestimate the combination of this heavy theme, tons of action, and the fact that this could be the Superman movie men between the ages of 25 and 50 have been waiting for years for. When you have a four-quadrant movie like I believe Man of Steel will be, that means you'll have moms, dads, brothers, sisters, aunts, uncles, grandpas, grandmas and your next door neighbor forking over their hard-earned money to see a film that'll be getting great word of mouth. It was a word I repeated plenty of times in the Four-Quadrant section, and that’s because it’s probably the biggest thing Man of Steel will have going for it when it comes to its chances at topping Iron Man 3 as the highest-grossing film of 2013. It was also no secret that one of the main reasons Superman Returns was such a flop was because of the distinct lack of action in a freaking SUPERMAN movie. As we saw in the trailers above, from Nolan’s Dark Knight Trilogy plus Inception, along with Snyder’s own resume, there looks like there will be an abundance of action. From the sounds of it, the last 40 minutes or so of Man of Steel is going to be an action-packed brawl between Superman and General Zod in Metropolis that will rival, if not surpass, the battle of New York City in The Avengers. How movie-goers react to the action in Man of Steel and whether or not they’ll keep coming back to see it on the big screen again and again will be the biggest key at topping Iron Man 3. So when all is said and done, with all of the above factors and probably many more that I couldn't fit into our Five Reasons Why... format, I truly believe Man of Steel will be the box office king when 2013 concludes. And just so I'm clear about my claim here, when I say I think Man of Steel will be the highest-grossing film of 2013, I mean domestically. I peg Snyder's film to end somewhere just below $500,000,000 for the year here in America, while struggling a bit to catch Iron Man 3 in the foreign market because of Superman being more American-oriented. Only time will tell, but if Supes gets anywhere near Tony Stark's $174 million opening weekend, we'll have a good idea if I'm right or wrong! Sorry to disappoint you but, Catching Fire is going to win the year (or Iron Man 3). I doubt Man of Steel will be in the running. Catching Fire will definitely be a box office smash, but it's late release date will keep it from topping Man of Steel, imo. It'll only have a month to run in 2013, plus it'll be coming out at a time with more competition surrounding it, so even it's longer term outlook will fall short I think. MOS has the rest of the year to run if it's successful enough, and I certainly think it will be. We're posting our review later today, and needless to say, they knocked it out of the park. That Rotten Tomatoes score is blowing my mind. if Nolan see this as the first of a projected trilogy, Man of Steel will reintroduce and reinvigorate the character, movie 2 will build momentum and movie 3 will reign as box office champ. Fair concerns. I'd argue though that the combination of Christopher Nolan's involvement, Zack Snyder's track record for visual-action movies and the Superman brand will be enough to originally bring in large audiences the first weekend. Then it will be that same combo and good word of mouth, plus action, that I think will give it legs. You're absolutely right though, if this is the hit I think it will be, then the already green-lit Man of Steel sequel will be even bigger. As it stands, Man of Steel already brought in $21 million from Thursday night/midnight showings, which is the largest ever for a non-sequel movie.